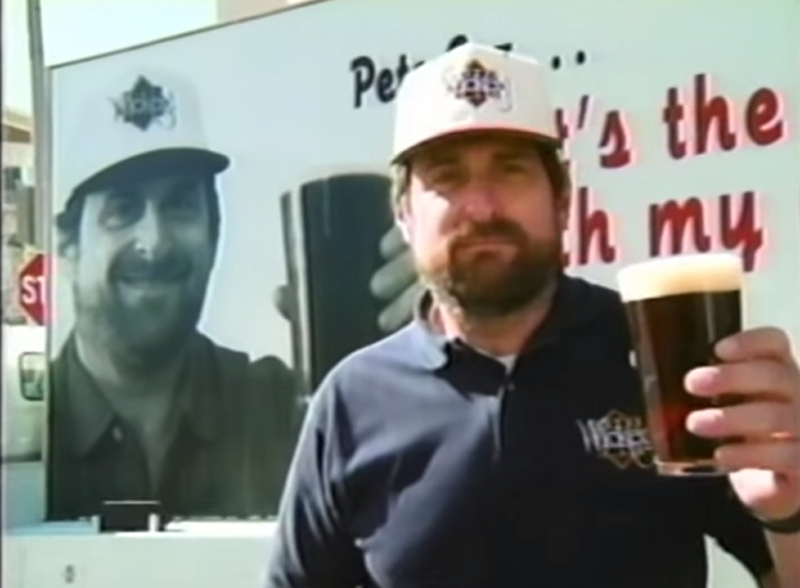 In 1994, Pete Slosberg starred in a national advertising campaign for his Pete’s Brewing Co. Screenshot via YouTube. The mad men from the ad agency told Pete Slosberg, co-owner and public face of Pete’s Brewing Co., to sit down one breezy day at a red-draped table set up on a sidewalk in downtown San Francisco and stick a radio piece in his ear. Slosberg obliged. Above him and the table a sign read, in blocky letters, “PICTURE WITH THE REAL PETE $1.00.” Two rows of bottles of Pete’s Wicked Ale, the brown ale Slosberg first devised the recipe for as a homebrewer, stood to his right. An executive from the ad agency began speaking to Slosberg through the earpiece, telling him what to call out to passersby, unseen cameras catching it all. Stone-cold indifference. A shake of the head. The conceit of the commercial, which ran in late 1994, was clear: You might recognize Anheuser-Busch’s Clydesdales at a glance, but the namesake and co-founder of what was then one of the biggest small-scale brewing companies in America? Forget it. “The campaign deftly plays up his image as the quintessential little guy taking on the beer behemoths,” wrote Stuart Elliott, The New York Times’ long-time advertising reporter, who named the Pete’s ad campaign one of the best, for beer or otherwise, of the entire year. The approximately $1 million campaign, which would feature Slosberg in similarly hapless situations, was the first national television ad blitz for what was coming to be called “micro-brewing” or “craft beer.” A real watershed marketing-wise, the Pete’s spots helped introduce that many more Americans to the concept of domestic beer made in small batches with traditional ingredients. The commercials ran in primetime, no less, during breaks in hit shows such as Seinfeld, Melrose Place and Northern Exposure in major markets such as Boston, Minneapolis, San Francisco and Seattle. No other smaller-scale brewing company, with the exception of Boston Beer, Pete’s archrival in the 1990s with its Samuel Adams line, has since attempted a television campaign of such scope. (And Pete’s itself eventually petered out after a 1998 sale to Gambrinus.) The blitz was audacious then and still entertains 20 years on through the magic of YouTube.